WP Easy Contact Smart Search and Columns Addon helps you to filter and generate reports on your contacts and tasks. 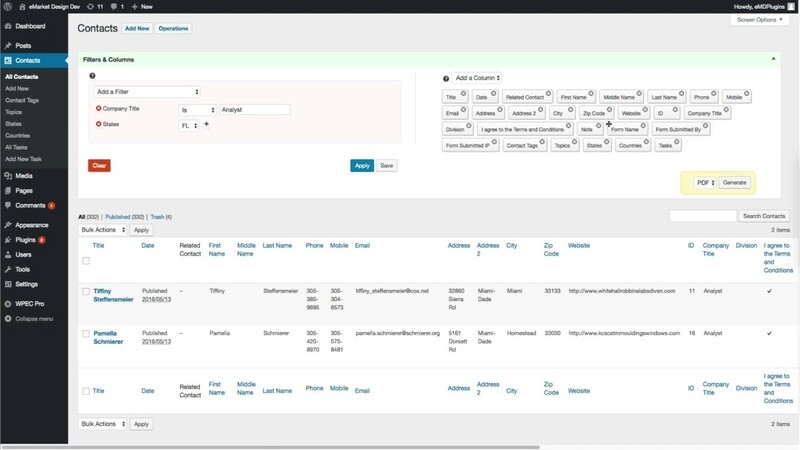 Search, create reports and enable/disable columns on your contacts and tasks. Find contact living in certain zipcodes, cities, or countries. List of contacts matching one to many tags. List of contacts who communicated on one to many topics. List of contacts linked to one to many tasks. A contact matching a phone number, IP address, mailing address etc. Easily configure your contact and task list by selecting the columns to display when viewing your entries. Sort the contact and task lists by fields. Completed vs In progress tasks. List of tasks due this week. Critical tasks which are still in progress.